The Bolshoi Ballet was in town recently as part of the Lincoln Center Festival, in the wake of the scandalous acid-throwing incident suffered by artistic director Sergei Filin, who watched from the audience and is looking in better condition than I had feared from all the news reports. It was a relief to see the drama move onstage. 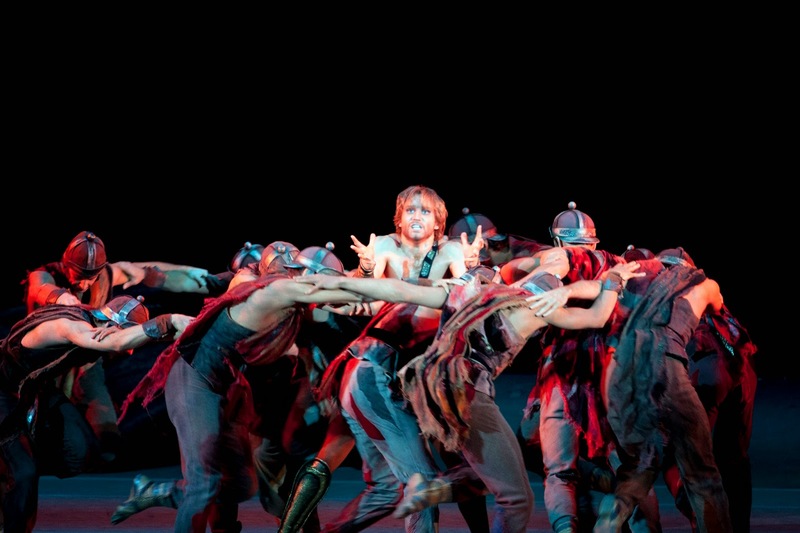 Spartacus, a historical ballet choreographed by Yuri Grigorovich to swashbuckling filmic music by Aram Khachaturyan, is a genre that is rarely produced in New York, with reason—there's a fine line between a historical costume dance and spoof. In the first scene's demonstrations of Roman military might, I had to stifle the giggles and adjust my mindset. Athletic bombast became the norm throughout the three-hour ballet, as the large cast's many men stomped and punched their expressions of prowess while carrying shields and swords, and wearing armor including shinguards and helmets. Many of the women, on the other hand, wore hand scarf-sized stylized togas with pointe shoes. Well, why not? Mikhail Lobukhin chomped heartily into the title role, flexing his tanned muscles and flinging his lank hair in rhythm. He literally flew across the stage in jetés and even a rivoltade (a fancy, floor-stabbing tour jeté), flinging his arms wide and thrusting his chest out in extreme confidence. Simon Virsaladze's costumes for the principals, despite their mixed messages on veracity and a tendency to over-weaponize, were flattering, including Spartacus' red, one-shouldered obi/loin cloth over grey tights. Svetlana Zakharova, glamorous and conspiratorial, gobbled even more scenery as the courtesan Aegina. Dripping with rhinestones to complement her mini toga, she used her fabulous forced arches as lethal weapons, repeatedly brandishing them at anyone nearby. You could practically hear her purring as she minxed her way through the ballet, slicing the poor air with her ferocious developpés, upturned palms, and in one scene, a floral staff. In the less gratifying "good" roles, Alexander Volchkov as Crassus, leader of the Roman Army, and Anna Nikulina, as Phrygia, Spartacus' gal pal, fared as well as could be expected. While Spartacus reads as kitsch much of the time, it has entertaining pre-battle pep rally scenes and bacchanales, although a little goes a long way, and many of Grigorovich's choreographic inventions—duly repeated, again and again—are artless and bone-jarring. Virsaladze's expressionistic scenery—columned stone temples—is modernized by an evocative, hammocked scrim raised up and down to conceal and reveal stage elements. This ballet may not be one that you'd want to catch repeatedly, but as a staple of the Bolshoi's repertory, it was a fascinating glimpse into the Russian cultural canon. Last week, I saw the company perform Don Quixote. There are few surprises since it's comparable to the ballet that ABT just performed earlier this summer. The Bolshoi's production, by Alexei Fadeyechev after Petipa and Gorsky, goes for busily milling crowd scenes, Cubistic painted flats by Sergei Barkhin, and a sultry Flamenco number, although in this scene both the pace and the leg-hiding floor-length dresses drag. Kristina Kretova, a leading soloist (the rank below principal) danced Kitri, flashing huge smiles and fanning her ruffled skirt with fervor. Lobukhin was her Basilio; despite its broad comic strokes, the role requires far more restraint than Spartacus, not to mention more clothing (the black tights tend to make Lobukhin's legs look skinnier than they are). 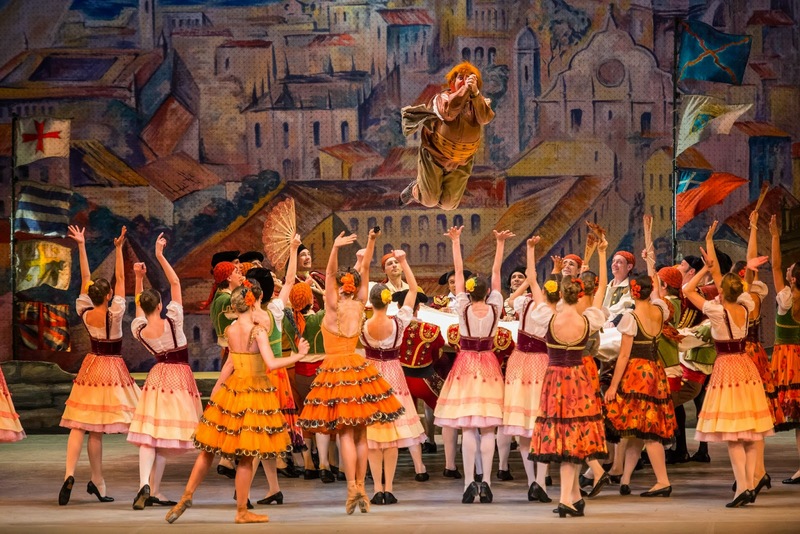 But the bold, joyful attitude of Don Quixote is well-matched to the Bolshoi's nature. The orchestra sounded bright and lustrous; Pavel Klinichev conducted. The Koch Theater is perhaps slightly small for these productions, but the closer proximity than the Met (where ABT performs its spring season) makes it easier to read. Some of the technique looked slightly ragged, especially in Don Quixote.